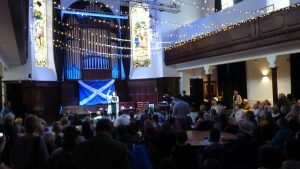 Then into St Luke’s, packed with happy Yessers. 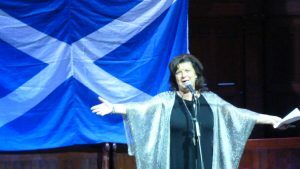 Elaine C Smith did a great job as MC as she led us through a cornucopia of music, dance, comedy – and the occasional bit of politics! 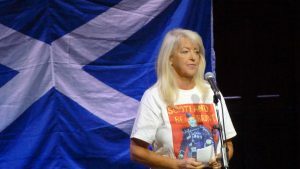 Lesley Riddoch gave an inspirational talk – just back from the Faroes (and its 49,000 population) – with an independent parliament, university, airline and all. Why can’t Scotland succeed, if the Faroes can? 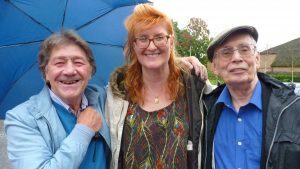 We definitely made the best choice, as it was gey wet down on Glasgow Green for the Yes rally – bad choice, Paul Dow and Ian Greenhalgh! We bumped into Ian Grant, Mary Knox and Theresa Laverty, Peter Bell, Ivan McKee, Angela Haggerty, Joanna Cherry – a’body was there! Alan Bisset and Janet Godley were hilarious but far from politically correct (as was Rosie Kane, though her story was serious enough!) Haggis McSporran and Whitserface were very funny too, and they must be wondering what all the subsequent fuss was about. 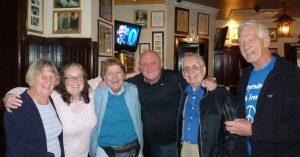 Eddi Reader gave a couple of well-received songs, and Elaine C Smith recited a poem. 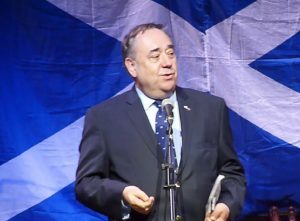 Ross Greer, Jeane Freeman, Tommy Sheppard and Carolyn Leckie did their political bit, but the highlight for most was Alex Salmond, who came on to rapturous applause. 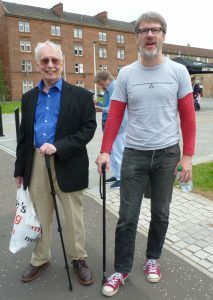 Peter and Jim Carey waylaid Eddi Reader on the way out, as we headed for the famous Sarra Heid pub in the Gallowgate. Several drinks later, we were best pals with the bar staff, and did our best to patch up diplomatic relations between Glasgow and Edinburgh. The car journey back was marked with a continuous sing-song, and we finished up in Kirkliston with a sax solo on IndyRef2 from Peter. Just goes to prove Yessers still know how to party!